Tamamystery is a cutesy virtual pet game with nothing mysterious or nefarious involved at all. Nope. Why would you suggest that? Also it’s in Flash, so there’s no download or anything, which means you should totes play it! Now that that’s out of the way, lets get to what this post is about: How I came to using papercraft for my Ludum Dare game! Once I knew I was going to do something Tamagotchi related, I started off by doing the classic Google image search to get ideas. I also watched some Youtube videos to get an idea of how the Tamagotchi gameplay typically works. I also came across this Tamagotchi device with the little cake on the top, which I liked, and is why I added a bow on the top of my toy. So I started creating the graphics of the game. I knew I wanted the game to look like a real device, and so it had to be fairly realistic looking. So I started in GIMP, first by taking photo of an actual Tamagotchi and adjusting the colours a bit. Using that as a basis, I was going to try to essentially redraw it in GIMP, but soon realised that it looked pretty bad, and was going to take a while to do. So I ditched that idea. Then I remembered “Hey, I’ve done nice vector stuff in the past, right? 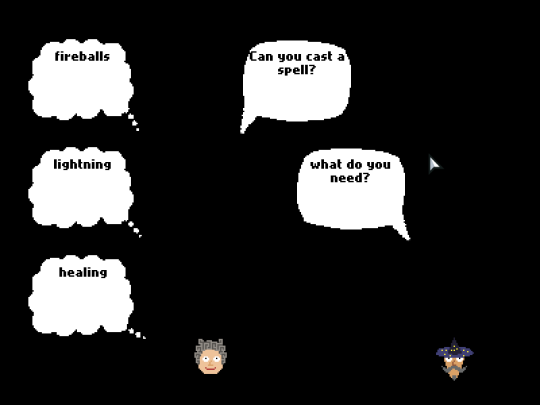 I’ll do it in flash!”. I quickly realised that THAT was going nowhere too. So I drew this little place holder graphics and moved on. Also, here you can see I had the idea of having a background that’s permanently etched in the game, like some Tamagotchis and small toys do. Then I tried to figure out what it would look like on paper, and an idea hit me: If I can make it look good on paper, why not just use that as the graphics as is! I have a whole bunch of cardboard in my room (I often use it for craft things for kids), I had everything I needed really. The actual process of making the toy wasn’t too hard, all I did was draw each piece lightly on the cardboard in pencil and then cut out the outline. I made sure to measure out a piece of cardboard with the same dimensions as the screen so that they lined up. To put the pieces together, I used Blu-Tack, which is good for two reasons. Firstly, because it’s not permanent so you can move things around. Secondly, it makes the pieces stick out a bit, so you don’t just end up with a flat piece of cardboard, but instead have something with a bit of depth in it. Depending on how much Blu-Tack you use, you can adjust the height of each piece a little bit. From side on, you can see the layers… kinda. That screen is coming of a little. To get it into the game, I just took a photo on my phone, put it on the computer, and then skewed it a little bit to compensate for the slight angle I took it at. Then I scaled it to make sure the screen was a nice multiple of the game window size, in pixels, because otherwise you get awkward half-sized pixels or blurry edges due to anti-aliasing, and nobody wants that. This one is nice in the way that you can clearly see that it’s made of paper, it’s not as obvious in the actual one. It looked pretty good at this point, but I felt like it needed colour to look more like an actual device. 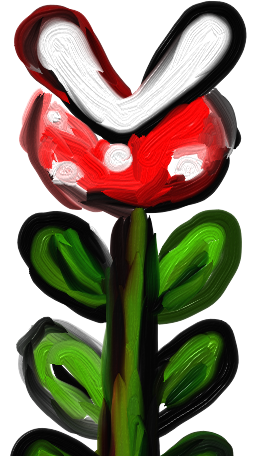 So I added in the colour in GIMP by using layers with the “Multiply” blending mode. If you just transparently overlay a colour, you lose some of the contrast as all your shadows become lighter, whereas with multiplying, you preserve all the blacks as black, and keep the subtle paper texture better. That’s a little tip for ya. And to add in the hands, I just took a photo of me holding it with one hand in the different positions, and photoshop’d that in with GIMP (am I allowed to say that?). It would’ve been nice to set up a tripod and take photos of me holding it in the different positions to get the shadows right, but that also would’ve taken a bit longer and would’ve meant I had to skew, scale and colour 4 photos instead of 1. And that’s it! I had a lot of fun with using papercraft, I might try to make an all-papercraft game next time. I’ll probably need some better equipment though. Thanks for reading! See ya later! I’m in for my 7th LD! And here some free tools for you! DPLoadScreen: quickly add a load screen between your levels inside Unity! 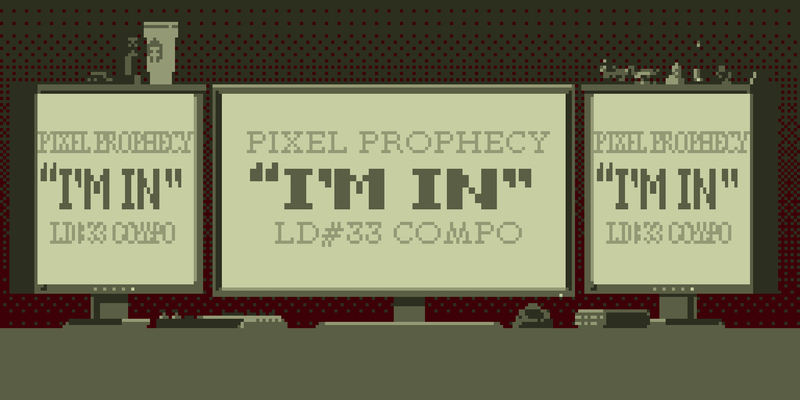 Been looking forward to this LD for a good while, mostly because the past events I had things come up on the weekend… Somethings seems to get drawn to Ludum Dare everytime I plan on participating. Even this time… but with the difference that I can actually sit in front of my computer and develop, instead of being away from home all the time. And to some extent the dog I’m taking care of during the weekend will benefit my productivity to some degree… be it fluffy d’awwww happiness, notifying me to take a break, provide SFX samples for me and such. Yea, having a dog as your companion is pretty neat. Might consider streaming the whole thing via twitch as well. But definitely will post an update once every now and then. Since I live in Germany and the start time of LD is kinda late at night I will also oversleep the start, but then will be rested well once I get up in the morning. Managing your energy and scheduling your overall day, including sleep, breaks and food is important a jam. Anyways, hope you all have a good week and I will see you this weekend! Even though we wanted a more organic look to the game, I decided to use Tiled to create the level, because that would make it easy to experiment with different layouts, and the excellent Tiled2Unity tool would generate the collision meshes for me. Once I had the level laid out in a way that worked well with the bouncing marios, I used Tiled’s “export to image” feature, and Ian used that as a reference to paint the lovely background that you see in the game. Probably anyone who’s used Unity for 2D has made the mistake of leaving the “fixed rotation” option off on your sprite’s rigidbody and then watching your character spin and flop around unexpectedly. 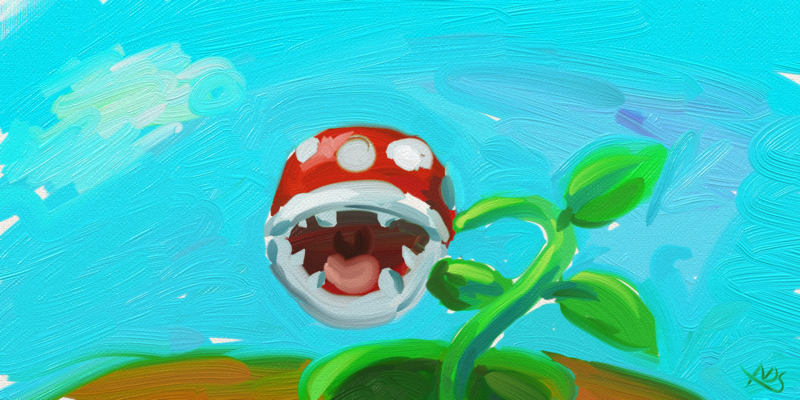 For this game I wanted mario to have a silly, clumsy quality, so I left it off intentionally. The challenge then was getting a reasonable amount of these clumsy marios to the end of the level. I used several invisible triggers to tell mario when to jump. Each trigger had a percent change of triggering, so we would end up with marios taking random paths through the level. 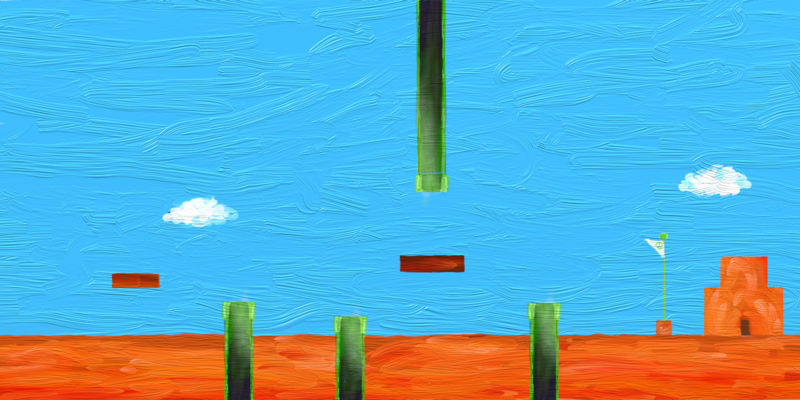 While Jesse made a mario spawner and worked on the plants, I painted the title screen as quickly as possible. I’m sure I didn’t spend more than 20 minutes on it. My plan was to hand paint the title text as well but that just would have taken too much time. At the end of Saturday we were at the testing stage, and while it was already making us laugh (a good sign! ), we had a lot of ideas for how to make it better. I assumed I wouldn’t have time for any of them. But Monday morning I was determined to add them. I added the “withering” plants feature and the heart counter as ways to add challenge and excitement to the game, and Brian added a score counter and cleverly tied the rate that marios spawned to your score, which leads to a hilarious avalanche of marios if you get far enough. At this point I think it went from being a silly game to one that was actually fun to play. Of course I always forget how stressful the submission process is, especially when you’re already exhausted from lack of sleep. But in the end I’m very happy with what we made. There’s only a couple of minor things I would have done differently. Much gratitude to my team, and to everyone who has left feedback! Hi, these are the lessons learned for Tales of the Underworld: Rebellion of the Souls, a retro platformer for the compo. You can play and rate the entry here, and also read a step-by-step log on how the development process went. Overall, I’m pretty happy with my entry. As explained in the log, I almost gave up on Saturday night, but still managed to pull out a finished game. That said, there is a lot of stuff I need to improve for next time! I didn’t do a brainstorming with possible themes in advance. I could have done so and save a little bit of time in Saturday’s morning. It took me many hours to decide what I wanted to do. I couldn’t have a very resting sleep. On Friday’s night there was way too much noise in the street, and on Saturday’s night I got some giant mosquito bites that were really itchy. A level editor. Please someone kick me if I think on doing that again in a jam. I overscoped and had to cut off a lot features. If I knew these features wouldn’t be in, I would probably have chosen a different game to implement. Lots of feedback and support on Twitter. I think putting screencaps and a URL that people could play instantly helped a lot to get this. A friend managed to stop me from quitting on Saturday night. I found a simple, cute art style that really suits the game and allowed me to produce animations (unlike in my last Ludum). I manage to cut off features and I still ended up with a playable game –although not as cool as I wanted it to be! 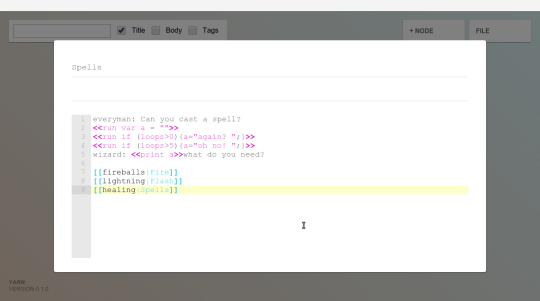 Atom text editor with vim key bindings. My gamejam generator for scaffolding the project. Bxfr and Garage Band for audio. Pixelmator and a Wacom table for drawing. Git and Github for version control. Lots of rock & roll and heavy metal! Another great Ludum Dare, Submitted! So my game is called Plothole. It should’ve been an adventure/mystery game about a detective who investigates some of the recent murders that might be a a job of one serial killer. SPOILER: in the end the detective would uncover that his 2nd (schizophrenic) self is in fact that serial killer. Amazing Ludum Dare! Even though I once again haven’t finished a game, I totally loved (almost, that missing boolean not bug costed me 2 hours of work) each second of it! I learned a lot about Unity’s new UI system, discovered new game genre I might like and wanted to do and finish! I had great time overall, nice to get distracted from some unpleasantness that happens around. I hope everybody had amazing time too, here’s to another great Ludum Dare, and for many more! 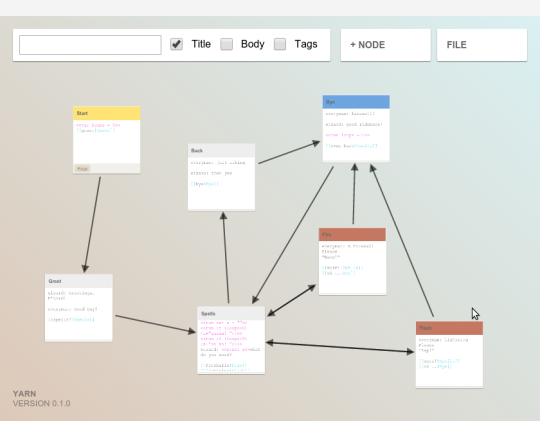 I always shared my LD brainstorming results after LD, so here goes: http://codebite.xyz/ld33/ideas/ Although I usually did it in Google Drive, I try to move away from Cloud Storage, coz I am paranoid. To Mr. Mike Kasprzak, for Ludum Dare itself and still maintaining it, and even making a new version! To Unity Engine Team, for amazing Game Engine. To Zhoot, AtomicVikings, yuraSniper, Leo, Skай, Zet and Thok, Jorge and my family, for being there. Taking part in the jam which is a welcome opportunity to get my #1GAM entry for August finished. Maybe Fraps to capture a video and Audials to convert it.